For Louisiana fly fishing and kayak fishing interests, 2018 was another notable year. Some good, some bad. Here's our picks for the top stories, in ascending order. 10. A good year for fly fishing events. The calendar was once again filled with events. 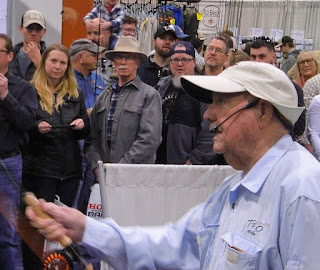 Some were "conclaves" - those 1 or 2 day festivals put on by clubs that feature programs, fly tying demos, casting instruction, exhibitors, raffles, and more. The Red Stick Fly Fishers' "Red Stick Day", the Kisatchie Fly Fishers "Cenla Fly Fishing Festival" and the Contraband Fly Casters "Contraband Fly Fishing Expo" all had good attendance and some great programs. Then there were those popular film festivals and "hangouts". The hangouts are informal gatherings featuring adhoc tying, casting, conversation - and beer. Also growing in popularity are fly fishing tournaments. The 2nd annual "Fly Fishin For The Mission" and "Rio Grande Rodeo" had strong turnouts, with out-of-state folks boosting the attendance. CCA STAR, Bayou Coast KFC, and Lafayette KFC all continued their passive tournaments with Fly Divisions. A few tournaments in Texas had good turnout from Bayou State anglers. For 2019, the number of in-state fly tournaments will double. The Kisatchie club won't have a festival (they only do even years), but the New Orleans club is hosting their inaugural "New Orleans Fly Fishing Expo" on April 6th. 9. State record white bass caught. In the final days of 2018, avid flyfisher Charles Miller made a couple of trips to the Pearl River and hit the jackpot on white bass and hybrid stripers. Two of those of fish were entered into the LOWA Fly Rod Division Top 10 listing - one white bass, the other hybrid. The white bass weighed at a whopping 3.98 pounds. If approved, it will take first place in that species listing. Charles is an active member of the New Orleans Fly Fishers club and in 2017, was recognized by Louisiana Sportsman as the "Fly Angler of the Year". He took his fish using a white/chartreuse clouser which he tied himself. 8. Rios added to state record list. In November it was announced by Lyle Johnson that the Rio Grande Perch would be added to the qualifying species for the state's records list. Johnson is Records Committee Chairman for the Louisiana Outdoor Writers Association (LOWA) which maintains the listing of top 10 fish of each species. Rios are native to south Texas and Mexico, but are considered invasive in Louisiana. They were established in the numerous canals of Orleans and Jefferson parishes as the result of aquarium releases. The flood waters of Katrina and Rita dispersed them to all waters in those parishes. The dire predictions that they would run displace native panfish populations failed to materialize. Rios have become a widely popular fly target. When hooked, the big ones fight like a wet cat. By default, any fish added to the Rod & Reel Division is automatically added to the Fly Division. Expect to see quite a few entries pop up in 2019, but not until it gets warm. 7. New books features Louisiana tiers. In February, Steven Schweitzer's new book, "Designing Poppers, Sliders, and Divers" was released to great anticipation. At the Atlanta Fly Fishing Show, two dozen of the books were sold in the first two hours! The book is the most comprehensive ever for the topwater lure maker. It includes over 800 photographs, and many dozens of methods, procedures, and tips. Two of the top popper designers in the country are from Louisiana - Kirk Dietrich and Ron Braud. Both were featured in the book. Tony Lolli's new book, "The Art of the Fishing Fly", featured the realistic flies of Fred Hannie of Lake Charles. Like Designing Poppers, this book features great photography of flies that focus on the evolution of the art of tying. The forward was written by former President Jimmy Carter. 6. Bull reds run wild at Grand Isle. Ride The Bull XI lived up to it's reputation as the world's largest kayak fishing tournament, with over 700 participants. Just as noteworthy was the number of bull reds caught - 99 - second highest in tournament history. But that was just the beginning of a great bull run. During an IFA Kayak Fishing Tournament in October at Grand Isle, over 300 bulls were caught by the 38 anglers participating. Even more impressive is that all were caught on artificial lures! Since IFA Kayak events are CPR, bull reds are eligible as all are photographed and released. A week later, kayakers flooded the pass and experienced a redfish blitz of unusual severity! Sadly it came to an end soon after when the first cold front of the season brought very cold weather to the island. 5. Where were the speckled trout? When it comes to weather, 2018 couldn't have been much worse for anglers in the western parishes. From Lake Charles to Shreveport, we experienced a bitterly cold January, prolonged chilly weather into early April, and throughout the year, excessive rainfall. Some stations saw as much as 140 percent of normal rainfall. All this bad weather had a great impact on the Calcasieu estuary. Salinities were near zero at Lake Prien for most of the year, and far below normal as far south as Commissary Point. The result was some of the worst speckled trout fishing in many years. During the CCA STAR tournament, some spots on the leaderboard remained empty until July. Things didn't improve much in October and November, prime time months for the estuary. Thankfully, redfish salvaged a large number of trips. 4. Steve Lessard does it again! Steve Lessard of Geismar is a kayak fishing legend. He's become what Kevin Van Dam is to bass fishing. Steve is the only two-time World Champion, with numerous tournament victories and multiple "Kayak Angler of the Year" and other awards from IFA and his home club, Bayou Coast Kayak Fishing Club. In October, Steve added to the accolades with an impressive victory at the BCKFC 2018 Championship. He and other qualifying anglers for the event braved severe weather at Lake Hermitage in search of 2 reds and 2 trout. His total of 14.17 pounds edged out 2nd place Jimmy Baker's 12.03 pounds. Steve's win also earned him enough points to also win "BCKFC Angler of the Year". 3. Sweet goodbye to friends of the fly. In March, Bernard Victor "Lefty" Kreh passed away at age 92. Lefty was recognized as the greatest fly angler of modern times. Outdoors writer, author, instructor, innovative fly tier, world-traveled angler, humorist and conservationist, Lefty's popularity skyrocketed - along with many other legends such as Stu Apte, Flip Pallot, Joe Brooks and Lee Wulff - thanks to the American Sportsman TV show in the mid-60s. As recently as a year before - at age 92 - he was giving seminars and casting clinics to large audiences at The Fly Fishing Show venues. During my lifetime, I'd seen Lefty almost two dozen times and in each case, he spent nearly as much time teaching kids and newcomers as he did conversing with experienced anglers and industry professionals. That might be his greatest legacy. Although Lefty was a resident of Maryland, he had an impact on many Louisiana anglers who saw him in person. And the many who learned from his books and videos. During his lifetime, he made several appearances here in Louisiana and numerous fishing trips. Nearly everyone who has spent time with Lefty has a story to tell. There was NEVER a dull moment with this great angler! Closer to home, we lost two great gentlemen of our sport. Maumus "Timau" Claverie, Jr. was a giant in marine conservation. A distinguished attorney from New Orleans, Timau was an avid fly angler, a board member of the New Orleans Fly Fishers, and former board member of the FFF Gulf Coast Council. For decades he served with the Coastal Conservation Association (CCA) on both state and national level, was a member of the IGFA board of directors, Billfish Foundation, and the Gulf of Mexico Fishery Management Council, and much more. Jim "Tuna" Thompson was a longtime active member of the Baton Rouge-based Red Stick Fly Fishers. A graduate of the Naval Academy, and later a practicing attorney for DEQ, Jim served on the RSFF board for a few years, and was a longtime fixture of the club's "Lunch Bunch". A complete fly angler, he loved fly fishing for bass, specks and reds as much as he did traveling for bonefish or coldwater trout. Over the past decade, Louisiana's "Sportsmans Paradise" has slowly become "Posted Paradise" as more coastal landowners have cut off public access to tidal waters. Our state remains the only one of fifty for which tidal waters are not public. This issue has been a major concern for kayak anglers, and in some cases, tournaments have been cancelled or relocated because of lack of public access. This past legislative session, Representative Kevin Pearson of Slidell introduced a bill that would've allowed public access - with some concessions to duck hunters and other private concerns. HB391 surprised many observers by passing House Committee. It even appeared to have enough votes on the House floor. That's when large out-of-state oil companies took action, bringing in over 50 lobbyists to work against HB391. When the full house voted, the bill was defeated 59 to 37. While every coastal angler agreed that HB391 had an uphill battle to become law, it didn't help when CCA - which had claimed neutrality on the issue - got involved and took a stance against the bill. It's not clear how many memberships CCA lost because of this, but based on Facebook comments, they have a lot of fence to mend. While many anglers were focused on House Bill 391, HB687 was every bit as important. It would've restructured basic hunting and fishing licenses, reducing the number from 117 to 30 licenses. It would've also raised fees on basic fishing licenses by 42 percent. While most would consider that increase a bit high, consider that we'd not had a basic fee increase in 20 years. Of greater importance, the increased fees were necessary for matching federal funds. LDWF receives no money from general funds, so all monies are from direct revenues plus money distributed by the Interior Department through Dingell-Johnson and other federal excise taxes. For every dollar the state generates directly, roughly four times that amount is recieved from the distribution. HB687 was necessary for LDWF to fulfill many funding needs, including completion of repairs on the Booker-Fowler hatchery, to combat giant salvania and other aquatic weeds, and to continue outdoors education programs. The bill passed committee with flying colors, but was defeated on the House floor. Sadly, most legislators saw the fee increase much like a tax increase. LDWF failed to make the point that, under new federal guidelines, the state did not have as many qualifying dollars to match with. They also failed to emphasize that if Louisiana loses these dollars, then more of the matching pool goes to states like New York and California. No word on whether an attempt in the 2019 session is in the works. This marks the last of activities until after New Years. So starting now, we'll be on break. If something does comes up, it'll be posted in the forum or on our Facebook page. So here's wishing a most blessed Christmas for all our friends! Hope everyone finds something under the Christmas tree they can use for their piscatorial pursuits in the coming year. And let's not forget the reason for the season: "For God so loved the world that he gave his one and only Son, that whoever believes in him shall not perish but have eternal life.". The Get Out and Fish! 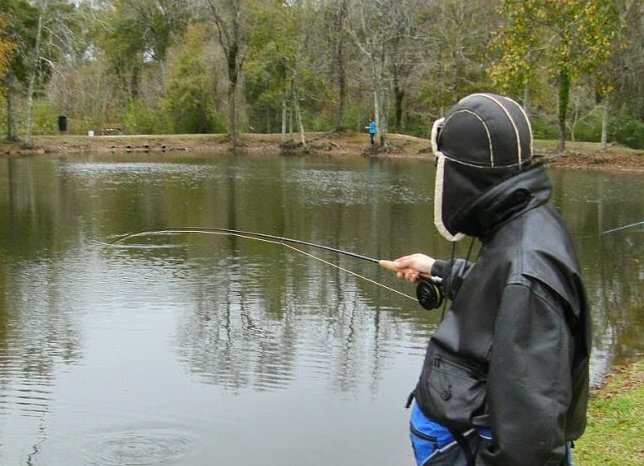 community fishing program partners LDWF with parks and neighborhood ponds throughout the state to provide a quality fishing experience for all ages. Each of the 12 community fishing sites is managed by inland biologists and stocked with channel catfish at intervals during the year, and with rainbow trout in winter. Yesterday LDWF announced that rainbow trout will be coming to the ponds in mid-January. Stocking information will be provided via their Facebook page. The ponds include: Girard Park (Lafayette), Zemurray Park (Hammond), Torres Park (Chalmette), Burbank Park (Baton Rouge), Kiroli Park (West Monroe), Turners Pond (Minden), Polk City Park Pond (Vidalia), Purple Heart Memorial Park (Ragley), Grambling City Park Pond (Grambling), Fabacher Pond (Youngsville), Mayfield Park (Ruston), and Hutchinson Park (Walker). Speaking of stockings, the LDWF Inland Fisheries Hatchery - in cooperation with the Natchitoches National Fish Hatchery, Shreveport's Cross Lake Fish Hatchery, and LDWF's Rockefeller Refuge - stocked over 8 million fish into 59 waterbodies across the state this past year. Gamefish species included: over 7 million Florida-strain largemouth bass, 412,000 bluegill, 117,000 redear, 58,000 northern-strain largemouth, 42,000 striped bass, 27,000 channel catfish, and 15,000 black crappie. Other species stocked included triploid grass carp, threadfin shad, and golden shiner. Most of the stockings take place in spring and fall, when fingerlings are large enough to be handled and water temperatures are conducive to growth and survival. While our native northern-strain largemouth are capable of reproducing adequately, biologists stock with large numbers of Florida-strain in hopes there will be sufficient cross-breeding. These hybrid offspring grow much faster and larger than either Floridas or Northerns, and make up almost all of the 10+ pound bass caught in Toledo Bend, Caney Lake and other state waters each year. 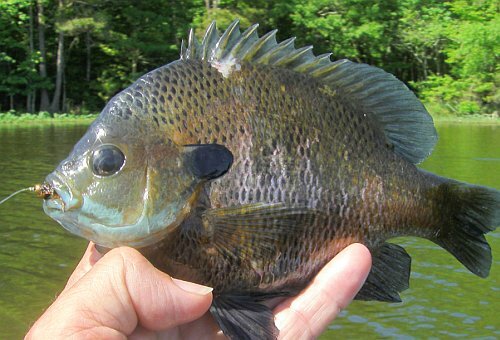 Last week, over 4,800 black crappie and 4,600 bluegill were stocked into False River near New Roads. 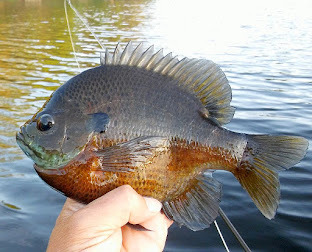 The average size of the crappie was 5 inches, while the average size of the bluegill was 4 inches. The fish were reared at Booker Fowler Hatchery near Forest Hill. Additional stockings will continue on periodic basis. Other species stocked in recent months include largemouth bass and redears. The stockings represent part of the efforts to restore this once-great fishing lake, at one time ranked one of the five best freshwater lakes in America. In the late 90s, the lake began a rapid decline, blamed in large part on agricultural drainage into the lake, resulting in a buildup of sediments over the large shell beds that served as spawning beds. Another part of the restoration will revive the "flats" that were covered with sediment. Beginning in mid-January, an estimated 95,000 cubic yards of sediment will be dredged from the lake bottom on the North Flats using geotubes that filter out the sediment and transport it to an area adjacent to the lake. The dredging operation is expected to last about 7 months. Funding for the dredging project was secured by legislation sponsored by state representative Major Thibaut in cooperation with the False River Watershed Council. A watershed management plan, revised this past year, will draw from the expertise of many parish, state and federal agencies to insure the longterm vitality of False River. Each winter, over a dozen ponds across Louisiana are stocked with rainbow trout. Some of the stockings are by local agencies. 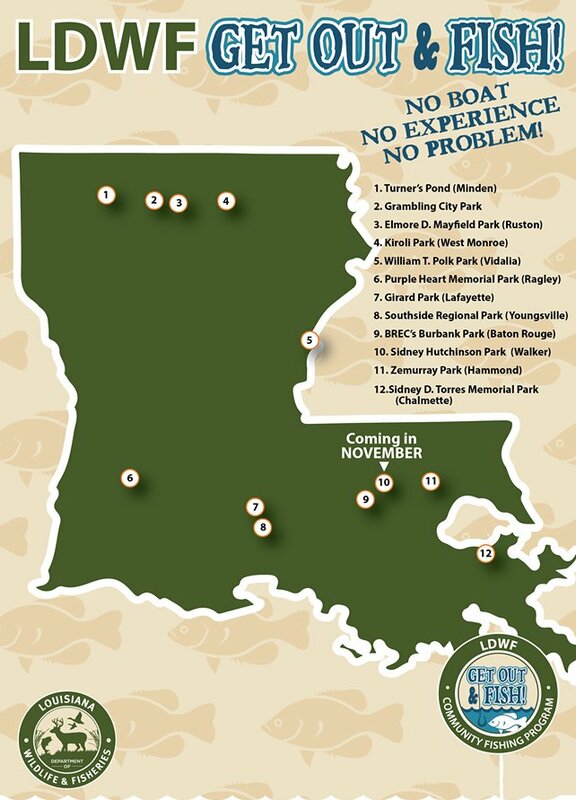 For example, ponds in East Baton Rouge Parish are stocked by Baton Rouge Recreation (BREC). Most ponds are stocked by Louisiana Department of Wildlife and Fisheries under their "Get Out and Fish" community fishing program. 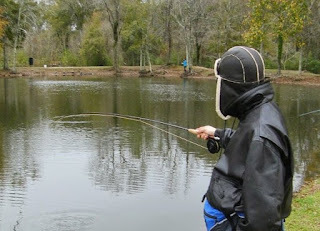 Yesterday, BREC kicked off rainbeaux trout season with stockings at three ponds: Palomino Park, Zachary Community Park, and Howell Community Park. While the stockings usually bring euphoria among fly anglers, there was some disappointment. For one, none of the ponds in south Baton Rouge were stocked - first time ever! Second, the number of ponds stocked continues to decline, from five in 2010 to three this year. 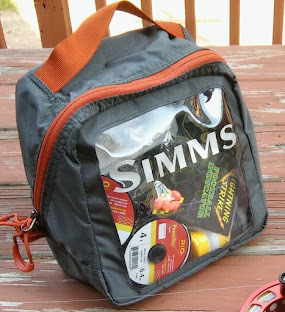 Still, we expect fly anglers to take advantage of what's available. A few things to keep in mind. Even though trout are not regulated by LDWF, you do need to have a Louisiana fishing license. All fish must be caught on legal recreational tackle (rod and reel, fly tackle or cane pole). Most of the stocked fish are between 8 and 12 inches, but each pond will have several up to 16-18 inches to give anglers the opportunity for a bigger fish. For fly anglers, it's an opportunity to enjoy good fishing at a time when native species like bass and bream are sluggish. All that is needed is a 5-weight outfit. However, for those with an ultralight outfit (3-weight or lower), the fun factor is amplified! Regarding flies. The first couple of weeks the fish are opportunistic. 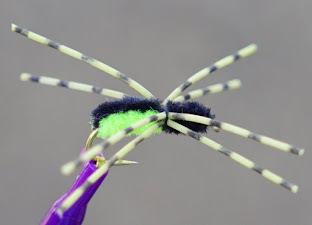 An olive or black woolybugger will work best, along with a few nymphs such as Prince Nymph, Copper Johns, Hares Ears, and San Juan Worms. Once the trout have acclimated to their environment, dry flies work very well late in the day. 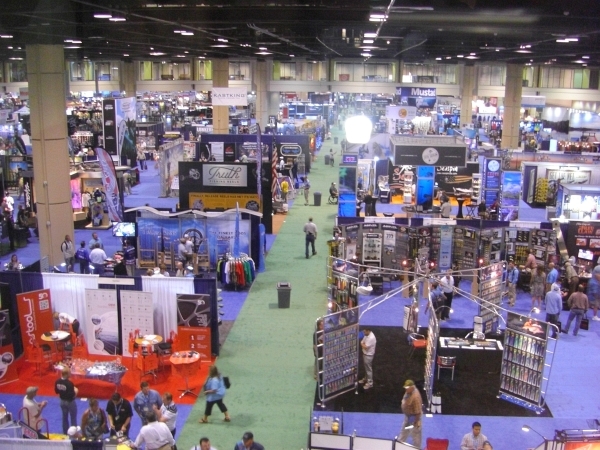 The week of October 16-18, 2019, the American Fly Fishing Trade Association (AFFTA) will host the International Fly Tackle Dealer Show (IFTD) at the Denver Convention Center in Colorado. For the first time in 10 years, the show will not be co-joined with ICAST, the world's largest fishing trade show. When the decision was made to separate, it was met with some concern about exhibitor interest. Well that concern is no longer. Earlier this week, AFFTA announced that all of the exhibitor booths for the show have been sold, and that a waiting list is already in progress. 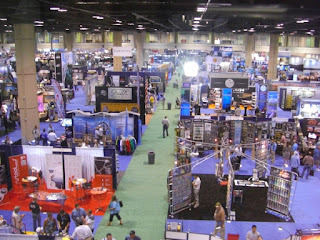 It marks the earliest that IFTD booths - separate or with ICAST - have been completely booked. Acccording to AFFTA President Ben Bulis, the decision to move the show to Denver was to make it more geographically convenient for retailers. ICAST will continue to be held in Orlando for the foreseeable future. While IFTD gives retailers and media a look at all product lines, it's also the event at which new products are introduced and showcased. A light schedule with Christmas only a little more than a week away. Perhaps the biggest "happening" this week will be the stocking of rainbow trout in designated ponds. No dates have been specified, but we'll be monitoring. On Tuesday, the Contraband Fly Casters hold their monthly meeting at St. Paul Lutheran Church on 1620 East Prien Lake Road in Lake Charles. Fly tying and discussion at 6:00pm, meeting at 7:00pm. On the agenda: nominations for club directors for 2019, fishing reports. Guests are welcome. For more info, go to www.contrabandflycasters.net. Also on Tuesday, the Lafayette Kayak Fishing Club holds their monthly meeting at Pack and Paddle on 601 East Pinhook in Lafayette. Time is 6:00pm. This is the club's annual Christmas Party, food provided. Members encouraged to participate in Dirty Santa. For more info, go to www.lafayettekayakfishing.com. On Monday, the Kisatchie Fly Fishers will be holding their annual Christmas banquet. For more info, go to www.kisatchiefly.org. Also on Monday, the Red Stick Fly Fishers will hold their annual Christmas party. For more info, go to www.rsff.org. On Tuesday, the North Louisiana Fly Fishers hold their monthly meeting at the Red River National Wildlife Refuge in Bossier City. Gathering starts at 6:00pm, meeting at 6:45pm, program at 7:00pm. For more info, go to www.northlaflyfishers.org.